From pearl accessories and chopstick making to canoeing down the Isuzu River, Ise-Shima offers a splendid array of opportunities to get in touch with Japanese culture. Jump right in for a holiday you’ll never forget! We’ll also introduce some traditional crafts from Ise-Shima, which remain unchanged since olden times. They make for excellent souvenirs! 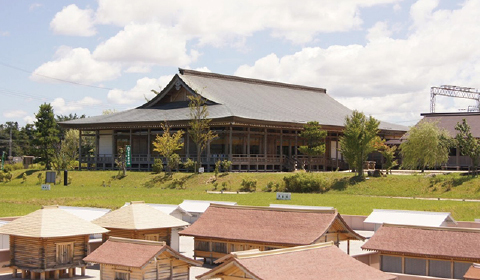 At Itsukinomiya Hall for Historical Experience, visitors can experience and learn about the history and culture of the Heian Period, when the High Priestess Saiō of Ise Shrine and her Saikū residence enjoyed their greatest prosperity. Why not try on the period clothing together with your other half? Make your own pilgrimage to Ise in a kimono! A historical town and Japanese spiritual home, Ise is one of the most suitable places to parade your kimono. You’re bound to feel splendid, and so will others nearby! Recently, the pair plan is also popular among couples. 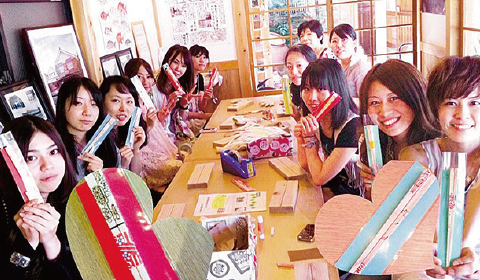 Wakamatsuya offers visitors the chance to make an original pair of chopsticks! Simply shave the wood into your shape of choice and add some letters with a hot branding iron. The chopsticks come in wrapping paper, so either use them yourself or as a souvenir. Experience scenes from Japanese mythology through an animated movie and beautifully constructed Japanese paper figures displayed in a dome modeled on the image of a primal forest. What did people travel to “Ise” for? What on earth is okagemairi? 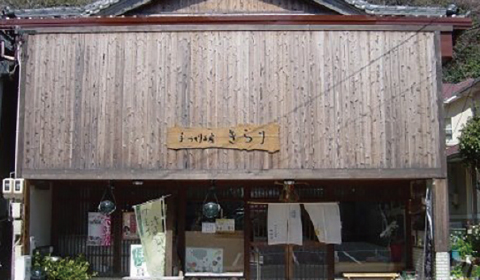 Enjoy a guided tour of the Okage Theater and traditional streets of Okage Yokocho! Try your hand at shell art at the Toba antenna shop. Visitors can enjoy making unique objects out of shells, including cell-phone straps and bracelets (both containing pearls), mini-planters, and lamp stands. Choose your favorite pearl oyster from a tank of over 500 Akoya pearls, then open it up yourself and take out the pearl! 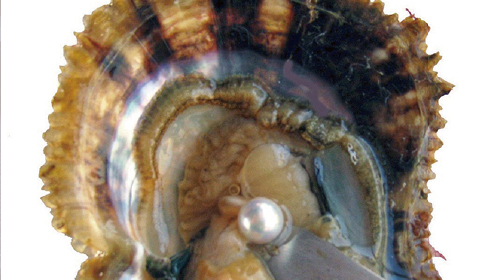 Pearl picking participants can then transform their pearl into their accessory of choice, such as a pendant or broach. Ama (shell diver) huts are places where the ama divers rest and warm up their tired bodies after diving for shells. 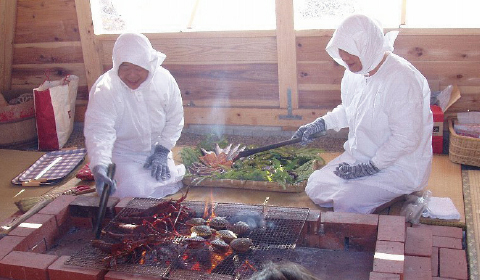 During the ama diver experience, visitors listen to current and former ama divers talk about their experiences while enjoying traditional dishes of tekone-zushi made with fresh seafood from Ise-Shima, such as spiny lobster (Ise ebi), abalone (awabi), and sea snails (sazae). 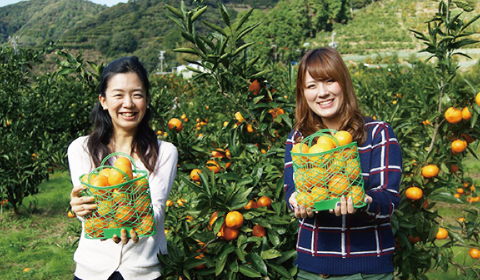 The famous brand of mandarin oranges grown in Gokasho is cultivated by mulching, on a south facing slope looking out upon Gokasho Bay, Minamiise. Visitors can enjoy picking these mandarins every year from the end of October to late January. 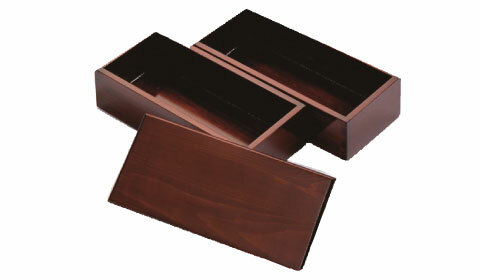 Ise shunkei are lacquer boxes made from cypress wood from the Misoma-yama forest area between Nagano and Gifu Pefectures, where the cypress used to make the Ise Shrine is grown. 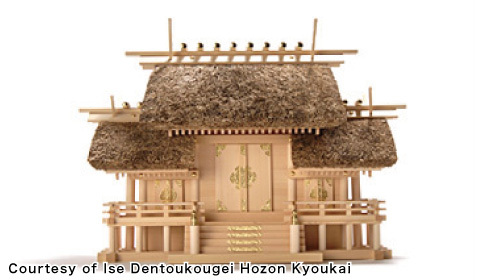 The wood is made into objects such as jubako (nest boxes) by joiners in Kiso County using wooden pegs called utsugi. After that, painters from the Association for Ise Shunkei apply lacquer to the boxes in four stages. These handy nest boxes are a traditional craft from the sacred land of the Ise region. 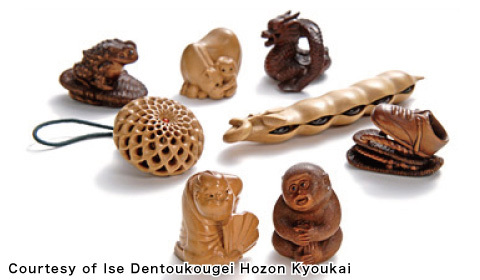 Netsuke are miniature sculptures measuring three to four centimeters in diameter. They were used as toggles to fasten inro (a case for holding small objects) and tobacco pouches to the sashes of traditional Japanese garments in the Edo Period. The netsuke made in Ise are characterized by a particular kind of boxwood grown on Mount Asama on the border of Ise and Toba, which is known for its hardness and density and nicknamed “the wooden jewel.” The reason why so many netsuke are crafted in the shape of toads is part of a Japanese play-on-words using the common expressions “kyaku o hiku” (win customers) and “bujikaeru” (return home safely). 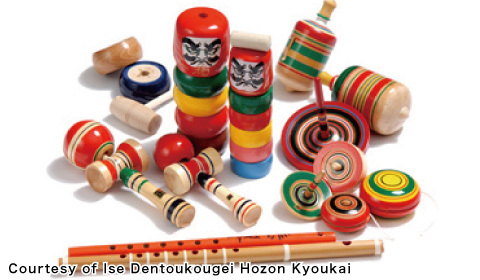 Ise gangu kurimono are brightly colored toys made from wood from the Japanese snowbell (chishanoki) and crape myrtle trees. Highly regarded as souvenirs among pilgrims to Ise Shrine, before the war, Ise gangu kurimono gained popularity in the form of everyday objects, such as tobacco pouches and trays. Since the war, kendama (ball and cup toys) and yoyos have taken over as the most common forms. One example is a kind of spinning top called a narigoma, which is unique to Ise and combines the three elements of movement, sound, and color. Along with kurimono (bentwood toys), nerimono (kneaded dolls and masks) are a typical souvenir bought by visitors to Ise Shrine. 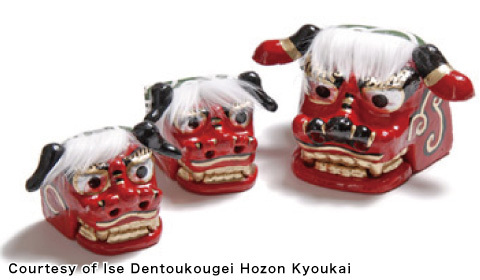 Shishigashira (lion masks) have been made since before the war and are used as ornaments to ward off evil spirits. Crafted in the traditional style, objects such as shishigashira and yumijishi (a smaller lion mask) are brightly colored and have moving parts. They also incorporate cleverly designed sound-producing parts. 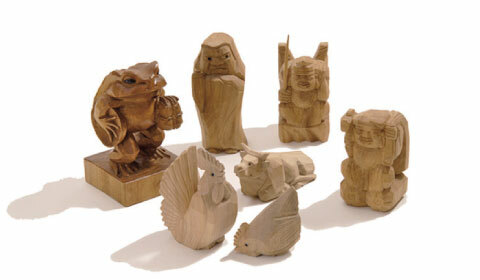 The ittobori tradition was born when carpenters began carving figures of Ebisu (god of fishermen and good fortune) and Daikoku (god of welath) using leftover material from Ise Grand Shrine. The sculptures were mainly carved from camphor wood and attracted attention for their beautiful grainy textures. Moreover, since the knife marks are retained by not polishing or coloring the sculptures, ittobori are characterized by a strong sense of power and warmth harnessed within unaffected beauty. These days, ittobori carved in the shape of the sacred chicken and toads of Ise and yearly zodiac symbols boast huge popularity as good luck charms. Sinc long ago, yabashi (arrow chopsticks) have been considered great souvenirs to buy for one’s partner(s) during a pilgrimage to Ise Shrine. They are typically made from the material leftover after rebuilding the shrine. 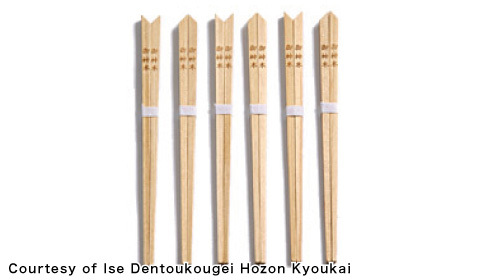 The design of the chopsticks is based on the chigi (forked roof finials) seen on Shinto shrines, where uchisogi-style (cut parallel to the ground) chigi are used in the Naigu (inner shrine) and sotosogi-style (cut perpendicular to the ground) chigi are used in the Gegu (outer shrine). Please contact the individual facilities or stores for reservations or inquiries related to information published on the website.